Stunning textural elements create The Architectâs Hale - truly a one of a kind Hawaiian Experience. Designed by one of Europeâs premier architects, this exquisite abode was created around the sunny side of Haiku just a stoneâs throw from Mauiâs North Shore Coastline. The entire westward ocean-facing facade is completely made out of folding glass doors flowing toward the swimming pool and breathtaking ocean views. 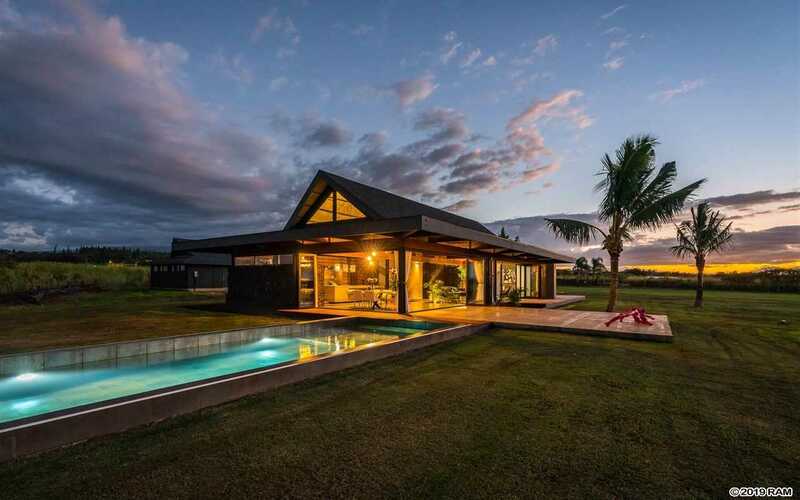 Throughout this brand new Hawaiian fusion home, sturdy hand-scraped timber beams rise to the bamboo roof which is truly the signature look of this Hawaiian Hale with a meticulously designed modern interior. The moment you pass through the steel entry you slide into the custom concrete kitchen accented with cocobolo and black oak. A 15â long poured-in-place concrete island proudly serves as the centerpiece of the beautifully crafted kitchen. The living room area boasts a luxurious play of textures which is the essence of this stunning architectural achievement. Between the lava rock wall and the Italian plaster wall (stamped with crocodile skin) is a volcanic rock interior garden and a backlit plasma drawn steel wall. The extra space in the loft area can be used to create a large office, a reading area, and playroom. Luxury knows no bounds on this exquisite Estate complete with itâs own garage and 2.5+ acres of fenced land for bountiful privacy just moments to the famous Hoâokipa Beach Park and the quaint townships of Paia and Haiku. Please, send me more information on this property: MLS# 381737 – $2,895,000 – 2245 Hana Hwy, Haiku, HI 96708.